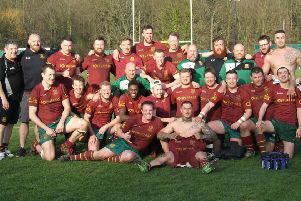 It might not save them, but Old Rishworthians gave one of their best performances in months to beat visitors Selby 33-21 at Copley yesterday. It also meant Selby may now be dragged into a relegation dogfight with Hullensians, the team Rishworthians are battling with to stay up. 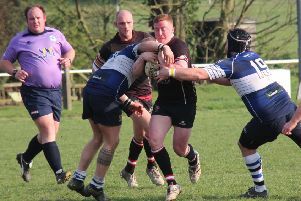 Selby host Hullensians in the last game of the season, which may prove decisive. “It just means we have to keep on putting in the sort of performances we have in this game,” said Rishworthians player-coach Chris Stone. That pressure came after a brilliant start by Rishworthians, who then found themselves trailing at half-time. Flanker Ethan Pollard was missing with a broken bone in the foot and 0when scrum half George Wright pulled out through illness, Liam Phillips stepped up and looked the perfect fit, until having to go off with a shoulder injury after 20 minutes. Flanker Jacob Bower, back from college, took over behind the scrum and looked as if he had always played there. His was one of a number of outstanding performances, including a captain’s display from Fraser Swarbrooke, who bagged two tries. The game started well and before they had even touched the ball Rishworthians had a penalty and Josh Kelly fired them ahead. His goal kicks and tactical kicking proved a vital factor in the match. He was on target minutes later to stretch the lead with another penalty. Selby looked unsure under the high ball and harassing play from the home men put them under pressure. Rishworthians drove on in the forwards and a half break and fine off-load from Bower put Swarbrooke in for his first try. Kelly converted. Rishworthians looked comfortable but Selby were determined and after Phillips went off the visitors started to put more and more pressure on the home defence. It eventually told with a converted try. From the restart it was all Selby again and missed tackles saw them run in a second converted try to take the lead at the end the half. Rishworthians were undeterred, starting the second half the way they had the first, and pressure on the visitors’ line saw Swarbrooke go over for his second try. Kelly converted. With teenage flanker Toby Muscat-Baron tackling everything in sight, Ben Waud and Ben Sutcliffe making inroads in the centre and Jack Andrews, after six months out with injury, providing stability at No 8, Rishworthians were showing the cohesion which has been lacking for most of the season. Bower made a great break and the ball was recycled for winger Jordan Bloem to dart in for his first try for the club. Another Bower break set up play for the forwards and after several phases prop Phil Kershaw crashed over for the bonus point try. Lack of concentration from the restart put Rishworthians under pressure and Selby took advantage, forcing their way over for a converted try to set home nerves jangling. The Rishworthian response, however, was determined and controlled and they pinned the visitors on their own line with numerous phases before Kelly put the icing on the cake with a coolly-taken drop goal.